Are strategies that worked in the past no longer working? Do you want to move forward but aren’t exactly clear what’s next? It’s not surprising. After all it’s hard to see the picture when you’re inside the frame. Habits are based on our beliefs. Over time beliefs you’ve adopted, usually early in life, can stop working for you. In fact they often start getting in the way. Maybe you work so hard because you believe you aren’t “good enough.” Or maybe you believe that you are only valuable if you’re constantly producing. Or perhaps your belief is that work is only valuable if it is hard… so when work is easy it makes you anxious. These beliefs may be at the root of what is getting in your way. 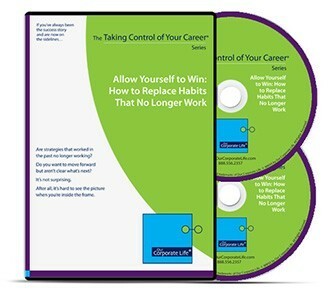 Why struggle when in less than two hours you can learn how to replace beliefs that are no longer serving you? Listen in and learn from executives as they learn how to make their behaviors work for them. ALLOW YOURSELF TO WIN is a powerful tool that helped me identify and change certain core beliefs that were keeping me "stuck". [It] enabled me to better articulate my thoughts and understand my behavior.